Oh my, Spring is here in the Intermountain West! 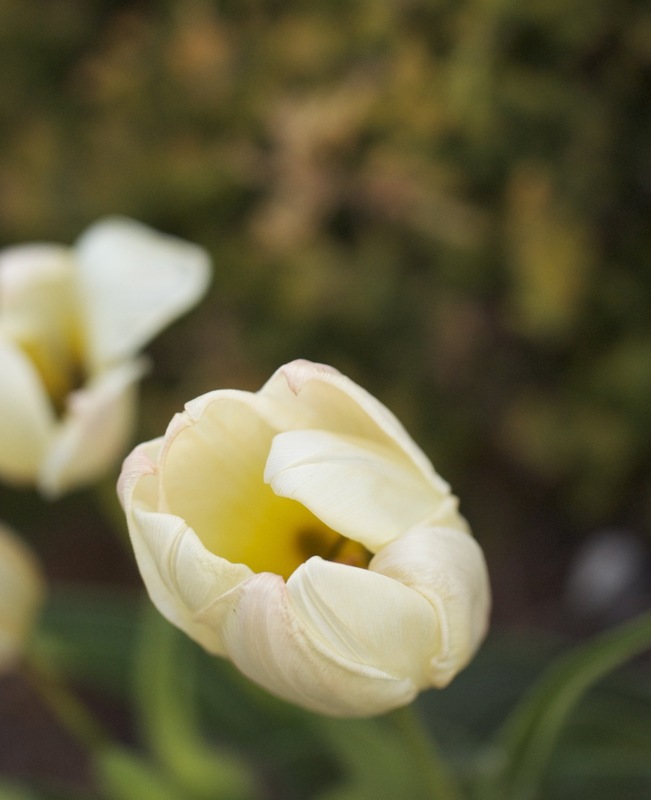 The lovely – and more than typical rain in March has lead to some lovely April blooms. The absence of heavy frosts and daily wind has been heavenly! In fact, I’ll venture to say it has been an above average Spring for gardeners! 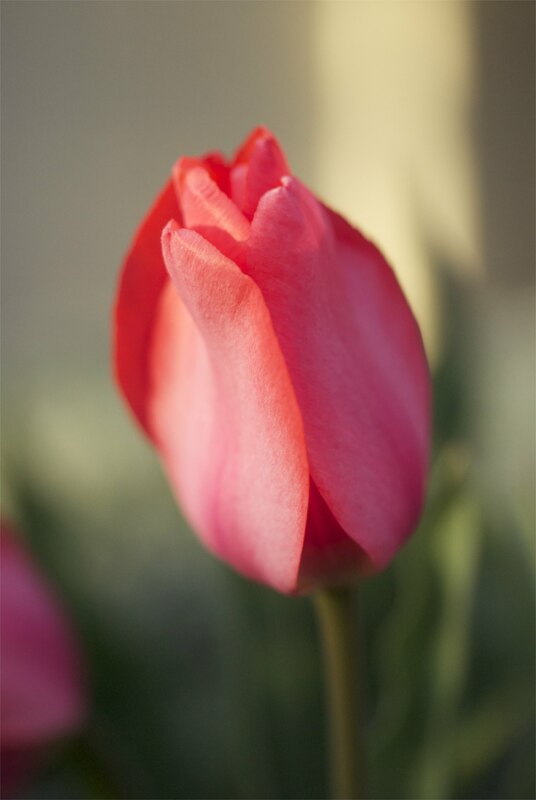 It is easy to tell that tulips are one of my favorite spring flowers. 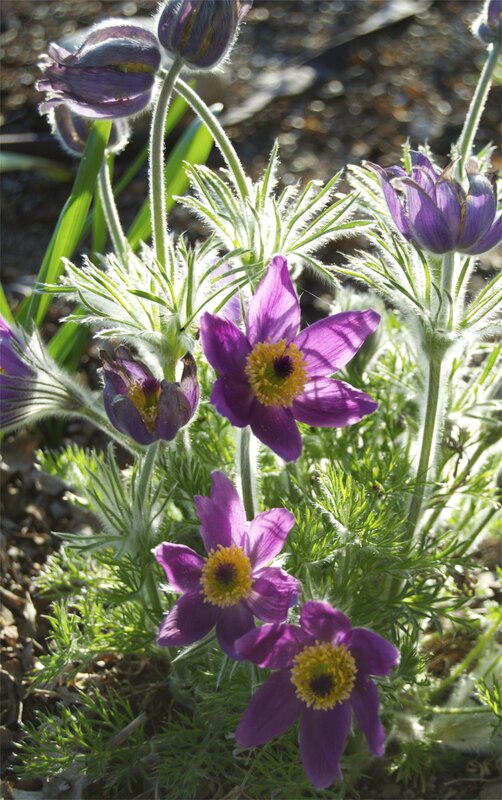 I have a couple of different types and several varieties around my garden. I like to combine tulips with interesting plant textures. 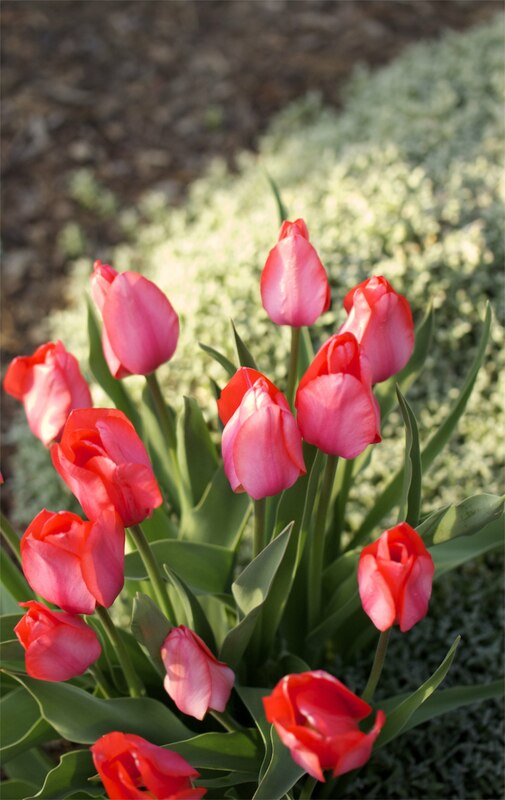 The idea being the “texture” plant will still be around after the tulip is gone and in some cases will help hide the dying tulip foliage. 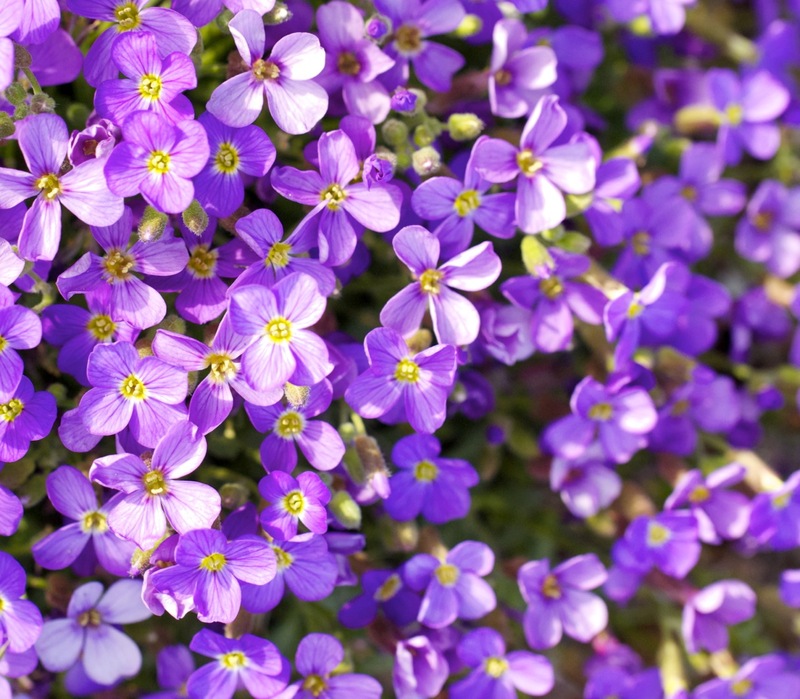 Aubretia is a great low-growing spring bloomer that does very well in our local (Boise valley) area. It is not picky about the pH of the soil it grows in and can take a low moisture environment. 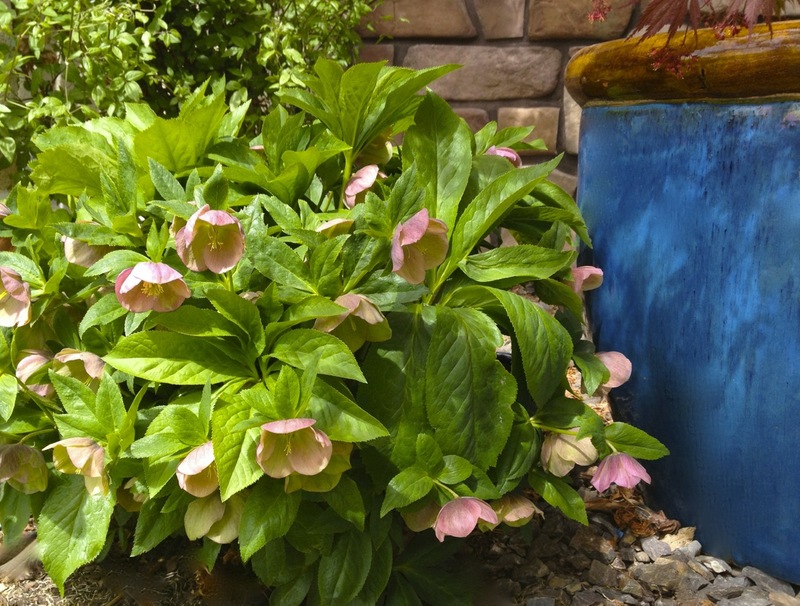 It accommodates full sun or part sun, but the best thing is the gorgeous color that lasts 3-5 weeks in the spring. Look at it up close and personal… now how can you resist this plant? Another combination is Tulip ‘Hakuun’ with Calamagrostis x acutiflora ‘Overdam.’ This grass starts with variegated foliage in the spring when it begins to grow. 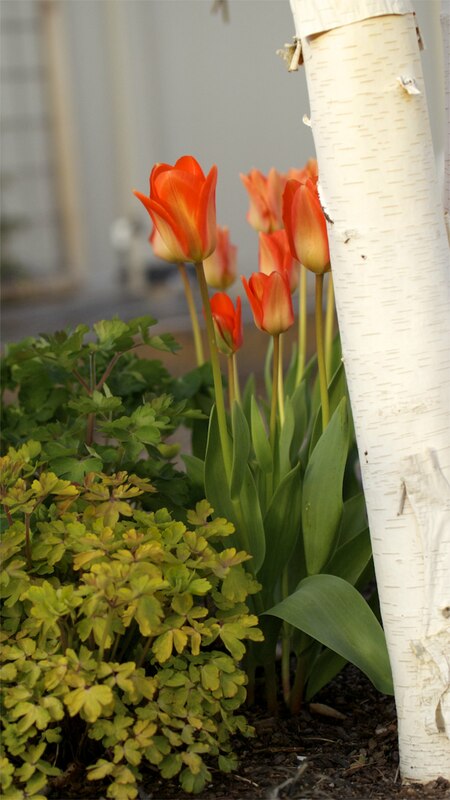 I like the white tulip with the variegated foliage. My favorite tulips are these that I picked up on a whim at a Target when I first started this garden. A different angle with a gold-leafed barberry behind them. 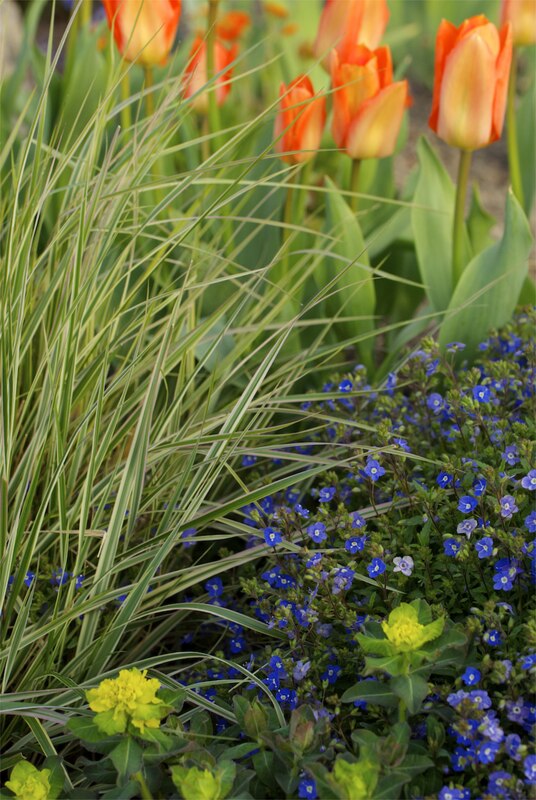 Moving to the back garden, I have tulip ‘Orange Queen’ in bloom with cushion spurge (euphorbia polychroma) and creeping veronica speedwell ‘Georgia Blue’ (veronica penduncularis and Calamagrostis x acutiflora ‘Overdam’ nearby. I have repeated this vignette throughout my main perennial border as I love the bright colors. Living under a big, bright sky, you must have bold colors! 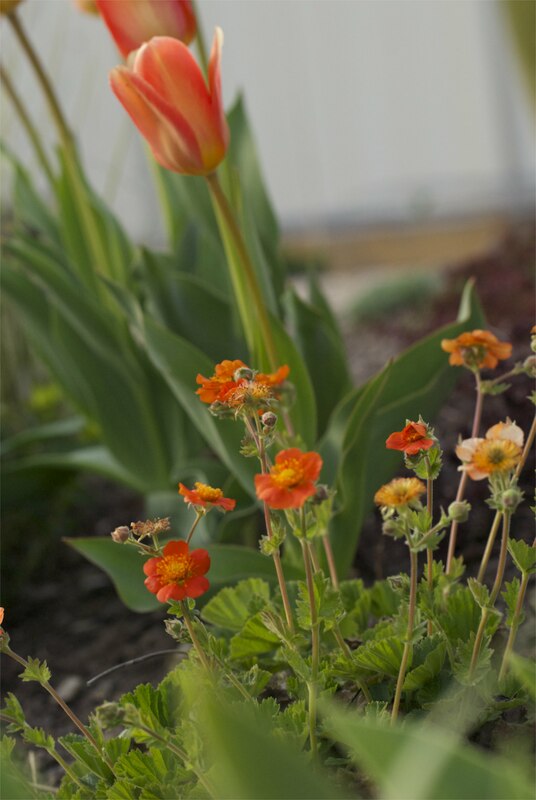 I also like the ‘Orange Queens’ beside the Himalayan birch (betula utilis ‘Jacquemontii’) with the golden foliage of an unknown Aquilegia. 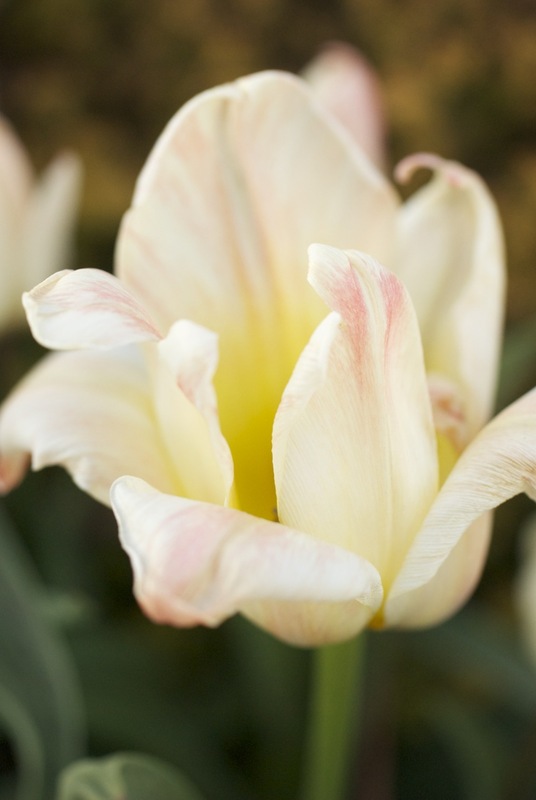 Now for a different type of tulip, this is tulip greigii ‘Fur Elise.’ It blooms quite early and I love the soft colors and also that it naturalizes providing more blooms as years go by. I have this combined with Thuja occidentalis ‘Rheingold’ for a sort-of soft earth-tone combination. 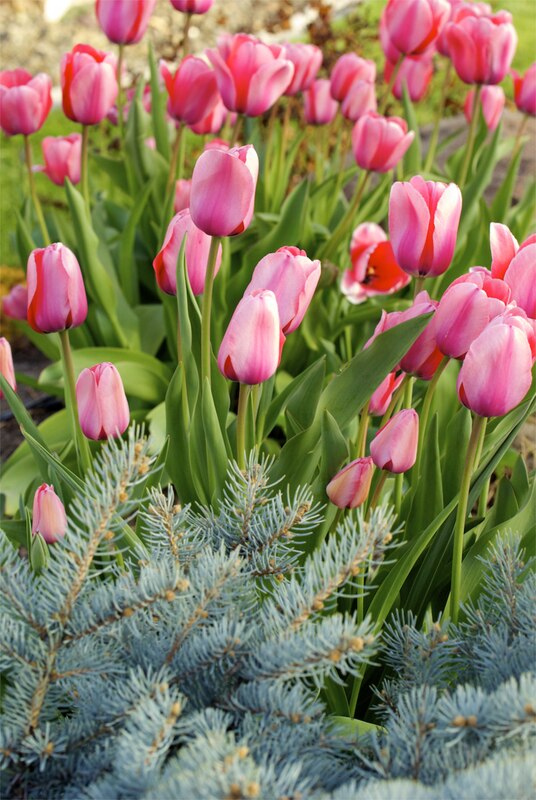 My last combination is another Darwin hybrid tulip that I do not know the name of due to bad record keeping… The gray/green foliage of cerastium tomentosum (Snow-in-summer) is directly behind the tulips. How about you? Have the Spring growing conditions been above average, average or below average? 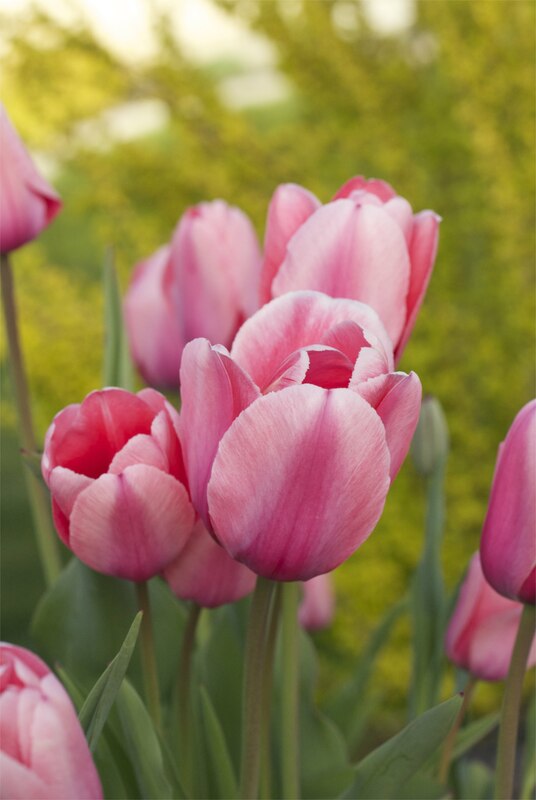 If you grow tulips, how do you use them in the garden? 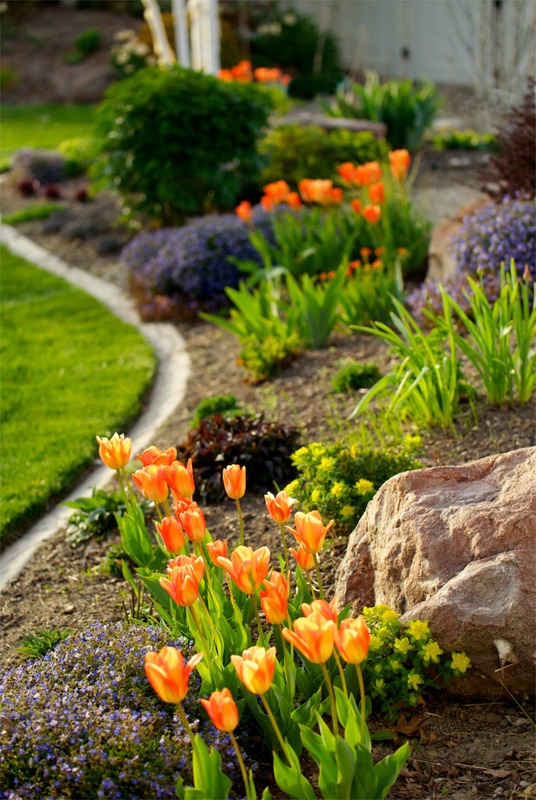 Your tulips are lovely – and I just love how you plan the different color combos and textures! Can’t wait till mine start blooming – should be in a week or so. Those pink ones from Target are gorgeous!! Thank you for stopping by. Yes, those from Target are great and who would have known! 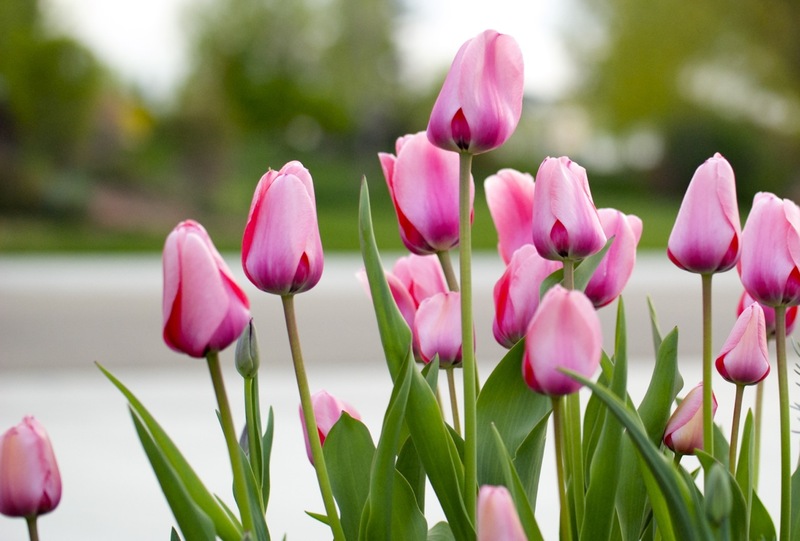 I will stop by to see your pretty tulips! Oh my gosh those tulips r to die for!!!!! Absolutely stunning!!! They are all lovely! Yes, I like tulips too and have them mixed all over the garden. Like you, I try to plant them near things that will later hide the wilting foliage. 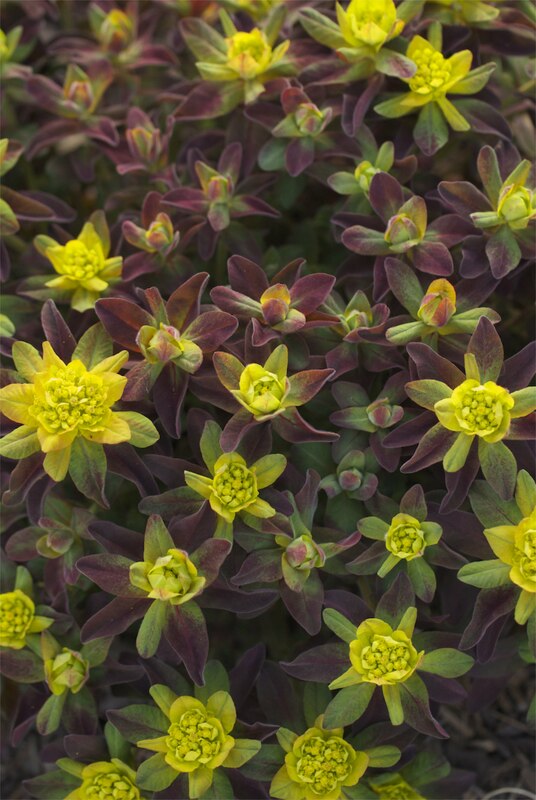 Those oranges are great, especially with the lime green euphorbia and the barberry. It’s been a perfect spring here the last two weeks too – warm and damp – lots of April showers, mostly overnight, and hardly any cold nights. The garden’s loving it, and so am I! Thank you for stopping by… I can’t wait to get an update of your Spring garden as well. You always have something beautiful! 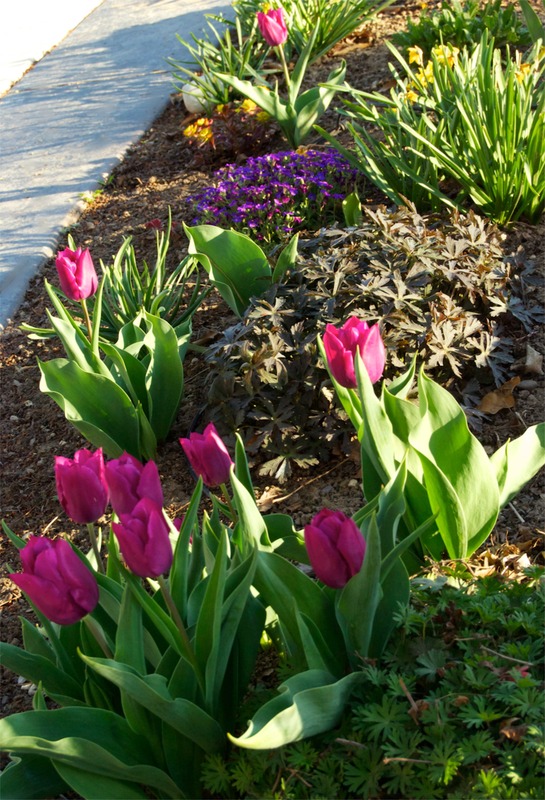 In fact, do you have suggestions of perennials to use to help cover the foliage of the dying tulips. I’ve run out of ideas for the time being and bet maybe some other gardeners have some suggestions. Oh Andrea – this was such refreshing post! I am coming backwater to enjoy again – and that bark of the Himalayan Birch was so interesting…. Thank you so much for stopping by… I will be at your blog soon. I’m behind in visiting my favorite blogs. Yes, I like the Himalayan Birch very much and so far it has been very happy in my garden. that is so sweet of you to say – and it made my day! And whenever I am missing you – I just look through your archives – I am getting ideas for when we move in a couple of years. The first thing I am trying is the apple tree trellis . Anyhow, I mentioned your blog on the radio the other day. The dj was asking for garden tips – on a radio station called Positive Hits (PER) and I mentioned having good soil (was a big lesson for me) and then told her to check out i-garden-daily – dot – com! I could use some of your skill in combining tulips with such as stunning cast of supporting characters. 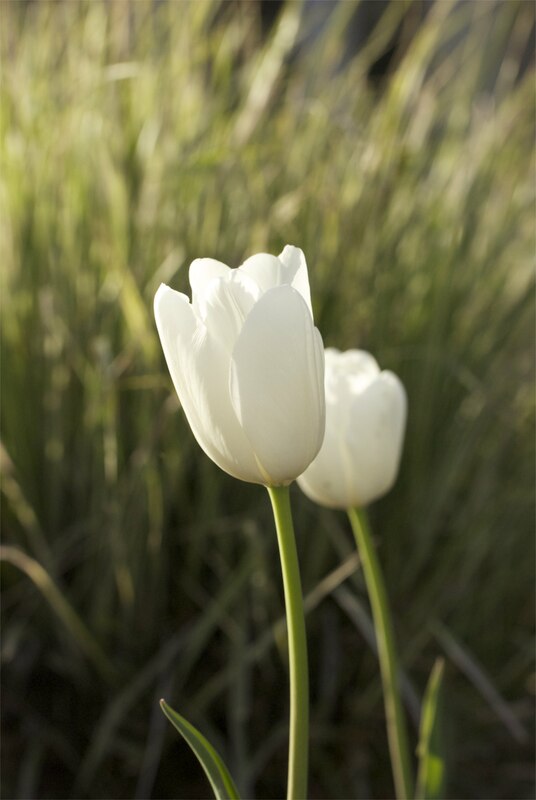 The photo of the white tulips with the grass background is especially lovely. Thank you so much but I bet you are underestimating yourself! One thing I am going to focus on this next fall is using spring bulbs that flower at different times and doing the random “scatter” to see what kind of effect I get. Gorgeous…you are ahead and we are very behind…cold and wet here. Very beautiful images. 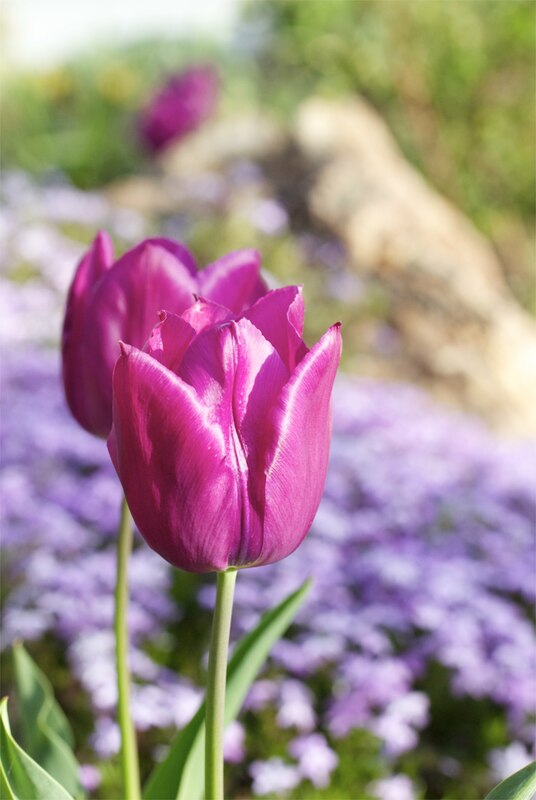 I do like tulip photos and there is such a short window to get them in the garden. I like all your garden colors, but am a bit partial to the purples and blues. You have some very pretty garden combos too. I never heard it called the “Intermountain West”. I will remember that!